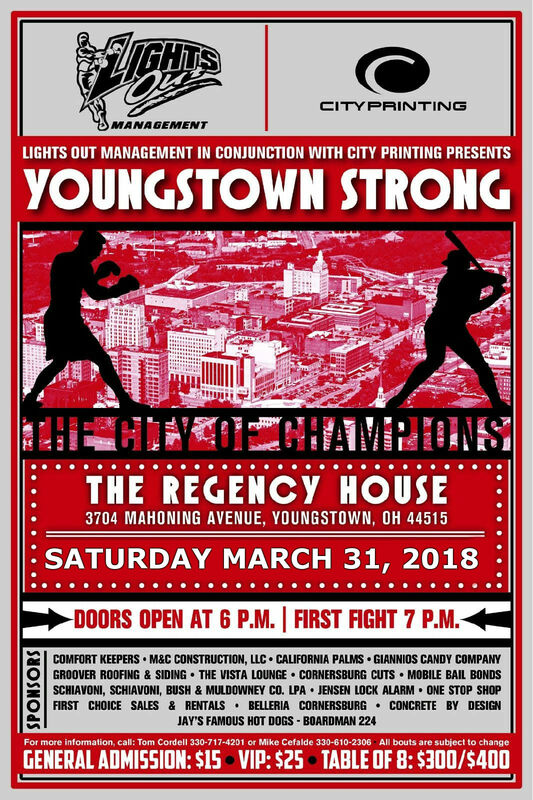 Craig Snyder will be selling and signing copies of his recently published book "The Boxers of Youngstown, Ohio: Boxing Capital of the World" at the Lights Out Promotions Youngstown Strong amateur boxing show on March 31st at The Regency House in Austintown. "The book is really to shed some light on so many boxers of the past and near past who have been overlooked and faded into obscurity and chronicles the careers of every active professional boxer that has come from Youngstown since 1891. Youngstown has an incredible array of fighters, many of whom are overlooked and I was truly humbled by learning through my research of many of these fighter’s ring accomplishments" Snyder stated on his social media. Tickets for the show start at $15 for general admission and can be purchased at the door or by contacting Tom Cordell at 330-717-4201 or Mike Cefalde at 330-610-2306. VIP seating will also be available for $25 and tables of 8 can be purchased for $300/$400. First bell is scheduled for 7:00 PM with the door opening at 6:00 PM.